The Vernitron 2000 is a bench top steam sterilizer which is designed for fast and effective operation between 239 and 275 degrees F. Steam for sterilization is generated through the use of a self contained water supply and electric heating element. All operations of the unit are controlled with the control buttons, fill and empty valves, which are located on the front panel of the unit. There are electronic circuit display for setting parameters, a pressure gauge, a solenoid valve controlled by a pressure switch and a safety valve for maximum safety present on the unit. · Display - Process messages, chamber temperature and temperature settings are displayed on this screen. · Process Time - Time passed since the beginning of the process is displayed. · Process Message - Current process is displayed. · Chamber Temperature - Temperature of the chamber is displayed. b) Used for passing to DRYING phase after getting sound warning (continues beep) at the end of sterilization phase. · Start Button - Used for starting sterilization process after setting sterilization parameters (temperature and time). · Set Button - Used for setting desired temperature and time values. During settings, by pressing this button following one other you can change between time and temperature values. During cycles, by pressing this button following one other you can change appearance of the temperature value between Celsius and Fahrenheit. · Up Button - Used for increasing temperature and time values. · Down Button - Used for decreasing temperature and time values. · Empty Valve - Used for evacuating steam inside the chamber at the end of sterilization phase. · Fill Valve - Used for filling the chamber with water up to marked level before sterilization phase. Package Dimensions: 24" x 16" x 14"
Marcus, Irving, Jossy, Mike, Daphne, Gary, Anne, or Jasmine. 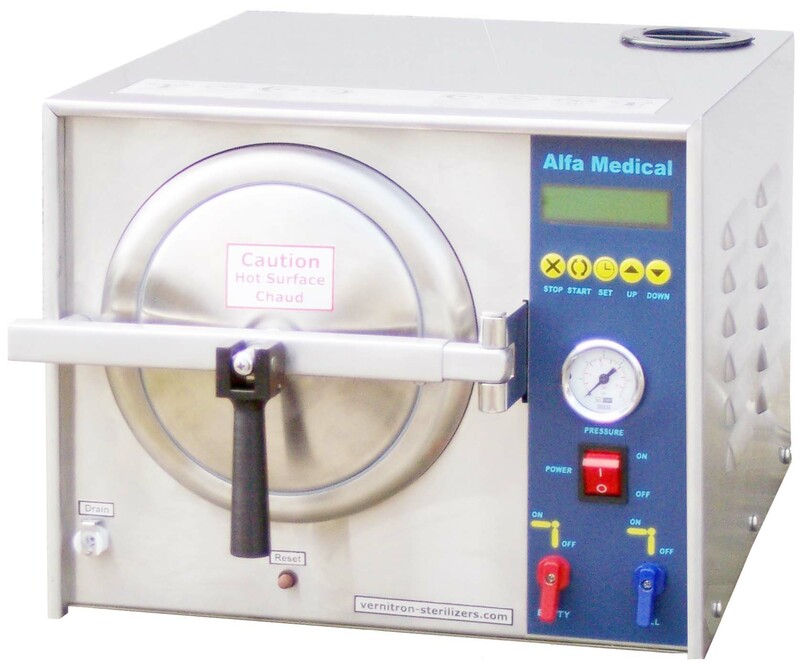 Alfa Medical, Your Sterilizer and Autoclave Experts. Find an autoclave or sterilizer that will sterilize all instruments. We manufacture and distribute all Autoclaves and Sterilizers. 100% Money Back Satisfaction Guaranteed!